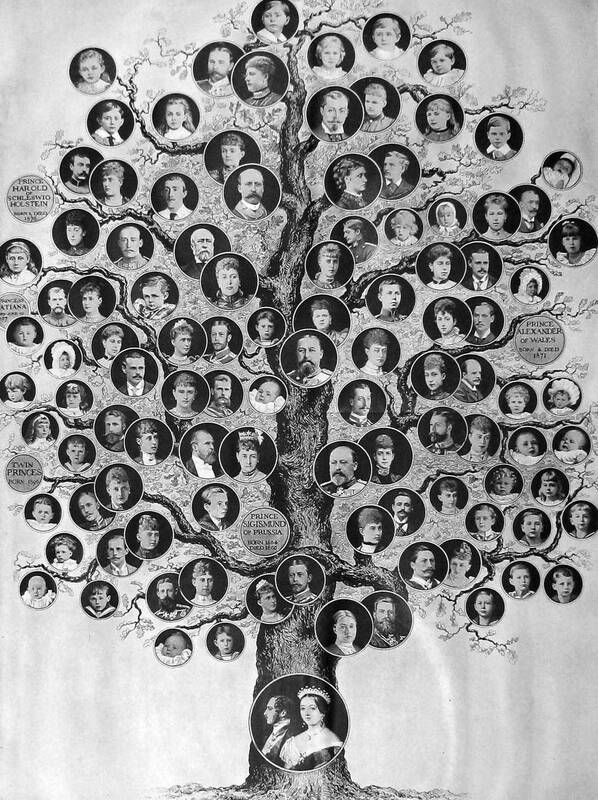 What makes the chart unusually interesting is both the extent of the Queen’s family in 1897, and the fact that almost every family member was illustrated – three of the blanks are for children who died in infancy, including Prince Alexander of Wales, the youngest son of the then-Prince and Princess of Wales. Another blank is for “Princess” Tatiana, the new-born daughter of the Emperor and Empress of Russia, who would perish with her parents and siblings at Yekaterinburg in 1918. Among the family members depicted are Queen Victoria’s nine children: Victoria, Empress Frederick of Germany; Albert Edward, Prince of Wales (later King Edward VII); Alice, Grand Duchess of Hesse (who died in 1878); Alfred, Duke of Edinburgh; Helena, Princess Christian of Schleswig-Holstein; Princess Louise, Marchioness of Lorne (later Duchess of Argyll); Arthur, Duke of Connaught; Leopold, Duke of Albany (who died in 1884); and Beatrice, Princess Henry of Battenberg. Queen Victoria’s grandchildren included Kaiser Wilhelm II of Germany, Crown Princess (later Queen) Sophia of Greece, the Duke of York (later King George V), Princess Carl of Denmark (later Queen Maud of Norway), Empress Alexandra of Russia, Crown Princess (later Queen) Marie of Romania, Princess Margaret of Connaught (later Crown Princess of Sweden), and Princess Victoria Eugénie of Battenberg (later Queen of Spain). Perhaps the longest-surviving member of the English Royal Family shown is Princess Alice of Albany, the daughter of Queen Victoria’s youngest son, Prince Leopold. Born at Windsor Castle in February 1883, she married King George V’s brother-in-law Prince Alexander of Teck in 1904. In 1917, as part of the rebranding of the Royal Family, many of whom bore German names and titles, Prince and Princess Alexander became Alexander Cambridge, 1st Earl of Athlone, and Princess Alice, Countess of Athlone. Lord Athlone, later Governor General of South Africa and then Governor General of Canada, died in 1957; Princess Alice – the last surviving grandchild of Queen Victoria – died at Kensington Palace in January 1981, just shy of her 98th birthday. *This purchase will need to be conserved and then framed; readers interested in supporting this initiative can go here. Thank you for so much information about Queen Victoria’s descendants. The chart itself is fascinating. The Royal Family should be referred to as British and not English. Great piece. Fun and thank you for sharing. How can I purchase a copy of this tree? I would also love to purchase a copy. Will we be able to? Thanks.